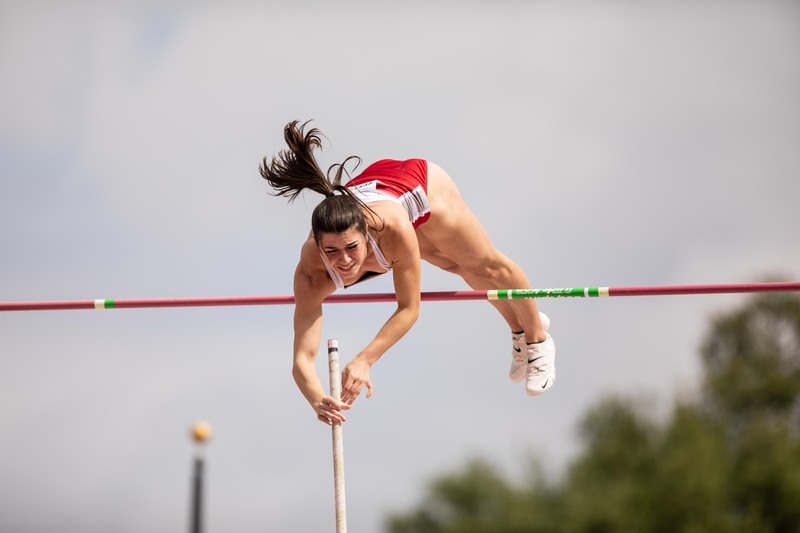 The University of South Dakota’s men’s and women’s track and field teams traveled to Tempe, Ariz. this past weekend to kick off their outdoor season to begin their first ever run at competing at the NCAA Division I outdoor track and field championships. During the meet, sophomore pole vaulter Bethany Buell broke the USD outdoor pole vault record with a 13-2 1/4 jump, more than four inches over the old record, while sophomore Alexa Duling just missed breaking the school record in the 400-meter hurdles by .33 seconds, running a time of 1:00.58. Both Buell and Duling claimed first place for the women’s team. Other notable performances by members of the women’s team include Junior Emma Erickson’s second place finish in the 800-meter run with a time of 2:09.98, just .49 seconds behind the first place winner. Erickson was also part of the women’s 4 x 400-meter relay team who placed fourth with a time of 3:55.29 with sophomores Ashley Sveum and Duling and junior Brittany Chambers. In the field events senior Jasmine Mosley placed second in the shot put, throwing 46-7 1/4. In addition, the women’s team had two top-five finishes in the javelin throw. Freshman Tansha Clarke placed fourth throwing 113-3, while senior Crystal Schiernbeck placed fifth with a throw of 108-2. The top finish of the men’s meet came from the 4 x 100-meter relay, consisting of sophomores Michael Burrus and Matt Kerswill and juniors Jeremy Blount and Jared Clement, which took second finishing in 41.29. Blount, of the second place 4 x 100-meter relay team also placed fifth in the 100 dash with a time of 10.82 and ran a 21.81 200-meter dash for eighth place. Other top performances include USD’s 4 x 400-meter relay team’s sixth place finish with a time of 3:24.06. The team included senior Bill Lane, freshmen Jason Steinberg and Parker Erickson and sophomore Casey Shade. Shade also placed sixth in the 800-meter run with a time of 1:52.26. Top finishes in the field events came from freshman Cody Snyder, who placed seventh in the discus with a throw of 157-11. Snyder also placed eighth in the shot put throwing 47-10 1/2. The next outdoor meet on the men’s and women’s schedule is the highly competitive Stanford Invite this weekend March 25-26 in Palo Alto, Calif.